Okay. This is a long story. But stick with me on this one and you’ll be rewarded in the end. At least I think you will be. 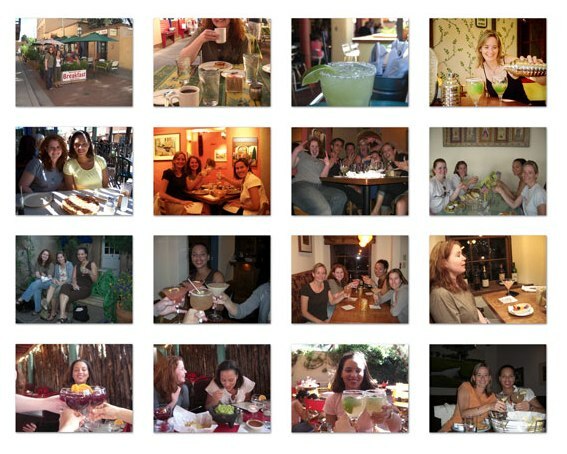 Back in June 2008, I took a trip to Santa Fe with my girlfriends. It was, I believe, one of the best trips of my life…definitely in the Top 10. And that’s saying a lot for many reasons: 1) I travel A TON, 2) it was a trip that did not involve my husband, who is my favorite travel companion, and 3) it was so completely low key that if I were to describe our days you’d wonder what the hell we did besides eat, drink, and laugh. But that was the beauty of it. It was the subtle moments in between eating, drinking, and laughing that, to anyone but a keen observer, were lost. In other words, you had to be there. So while I can rattle off a list of travel highlights over my lifetime like the Eiffel Tower, the Sydney Opera House, Anne Frank’s House, the British Museum, the Empire State Building, the Liberty Bell, Coit Tower, the Space Needle, Waimea Canyon, Cliffs of Moher, etc., so too can many others. 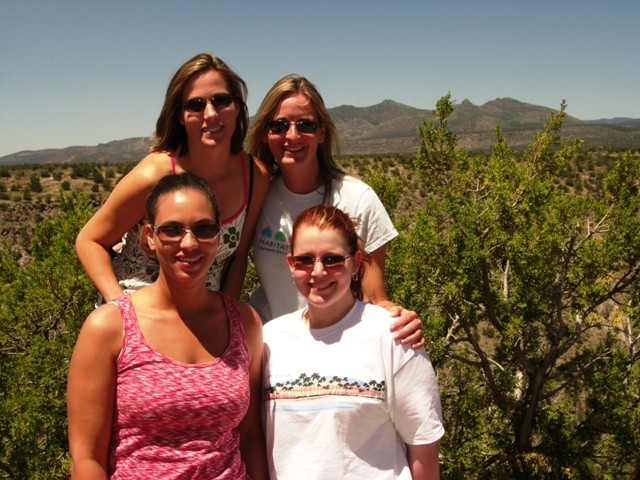 But no one, except for the three other women I was with, can lay claim to that Santa Fe experience. Now THAT’S a special trip! But there was also something that happened uniquely to me on that trip that none of the other ladies experienced. And it is this incident that also contributes to the fact that the Santa Fe trip was one of the best. It was there that I learned about the art of marbling, specifically paper marbling. And that had a profound impact on me. To make a long story short: Heidi and I stumbled upon a special paper marbling exhibit at the Governor’s Gallery in the New Mexico State Capitol. * Album Amicorum: Gems of Friendship in a Frightened World featured marbled works by 21 contemporary artists from 14 countries. We found the exhibit fascinating and spent a significant amount of time in the little gallery. The next day while we were at the Palace of the Governor’s, who should be in the courtyard demonstrating paper marbling other than the curator of Album Amicorum himself, Tom Leech! While the other girls wandered off, I stood there transfixed by Tom’s demonstration, not just because I found the art form fascinating but also because Tom was clearly an expert on the topic, spoke eloquently about it, and was a spectacular instructor. 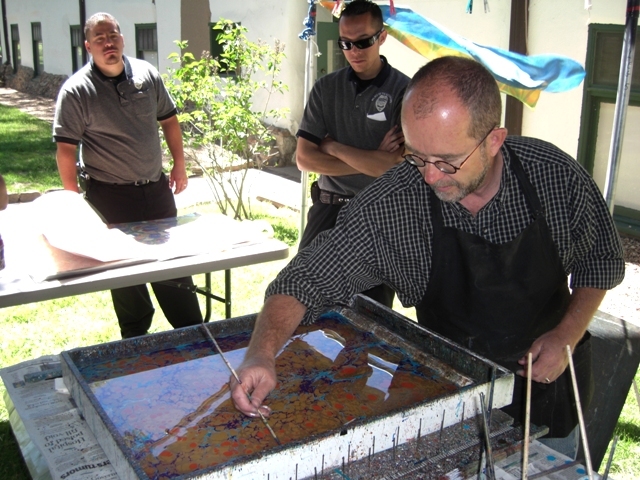 As I left the demo, I saw a flier about a two-day course on paper marbling that he was going to be teaching at the Santa Fe Art Institute (SFAI). At that very moment, I boldly declared I was going to attend. 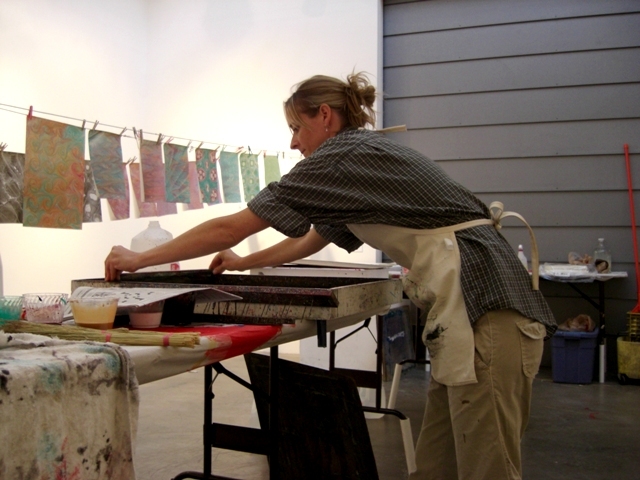 Two months later, there I was, standing in one of SFAI’s studios alongside Tom and seven other students as we embarked on a weekend of marbling. To say that the workshop exceeded my expectations by a billion-trillion-gazillon would be putting it lightly. 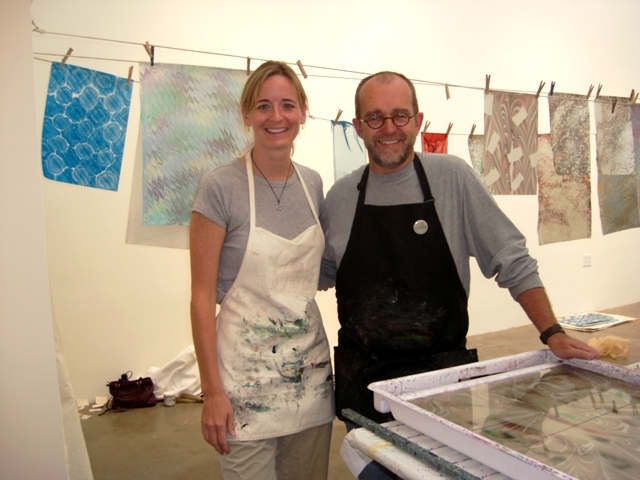 From my first marbled paper, I was completely head over heels about this art form that involves floating paint on water, creating a design, and then capturing it permanently on paper. For the first time in my life, I felt like there was an art form I could relate to and actually do…with confidence, with pride, and with passion. So a few months went by, I got distracted by the busy season for Hope’s Flame, further distracted myself by classes in other art forms, traveled a ridiculous amount, and just never made the time to complete my marbling studio. 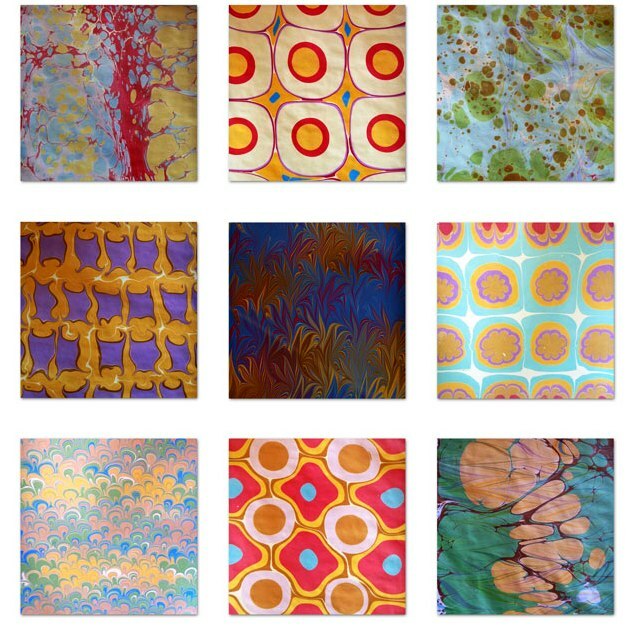 But I kept thinking about marbling, Googling marbling, checking out books at the library on marbling, checking up on Tom to see if he was teaching any more classes (or curating any more shows), and otherwise obsessing dreaming about marbling until finally, a few weeks ago, I summoned up the courage and bought the stupid Davey boards. Why, oh why, did I wait that long? 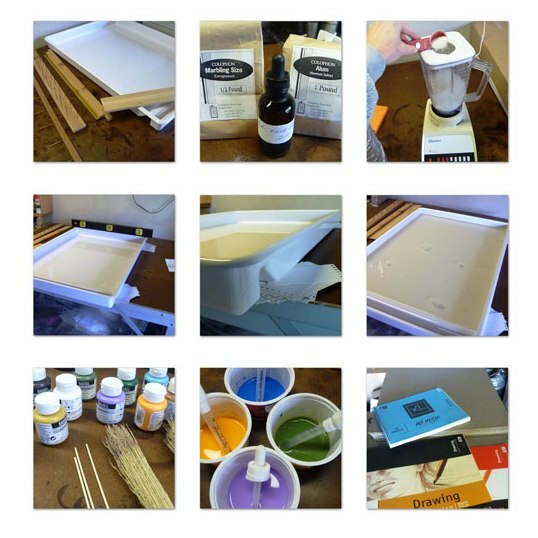 Last Monday, more than two years after taking Tom’s workshop, I set up my marbling studio…and proceeded to marble away for three straight days, until I used up the entire three gallons of size I had made and marbled about 70 sheets of paper. I can not even begin to express how happy this made me feel: peaceful, energized, brave, big, loved, grounded, special, proud, creative, impressed, beautiful, pleasantly spent, competent, out-of-this-world…just to list a few! Having been pro-actively unemployed for nearly five years, I can say that my writing and marbling are the two things I never would have pursued had I not had this gift of time, space, and energy to explore (thank you, Emmett!!). I’m not sure where either one will take me, or if their paths will cross (integrating the two is something I’m brainstorming about), but I do know I am a better, stronger person for having embraced these arts fully, for rising above the emotional fears that often freeze us in place, for finding the courage to dive into them (eventually! ), and for taking chances I would never had five (or even two!) years ago. For now, my marbling studio is packed up as I’ll be leaving it (and Emmett and Mira) behind to spend a few very cold weeks in Minnesota. But the second I return, I’ll be busting out the tank and carrageenan and alum and paints and paper, putting on my “permission-to-get-messy” clothes, and marbling up a storm. Anyone who cares to join me is more than welcome! * The entire Capitol is an art museum featuring some of the finest pieces of art by New Mexico artists and artisans. You’d be a fool to visit Santa Fe and not take in The Capitol Art Collection. It is truly spectacular.